Over the last few decades, an interesting phenomenon has been puzzling top economists and analysts – the profit margins of a few large and successful companies seem to be defying gravity, soaring above the rest. One would expect the powerful forces of reversion to mean and competition to have restored this anomaly within a decade or so; after all, that is how capitalism is supposed to work. Yet, year after year of super-normal margins for the elite few demands a new explanation of what might be going on in the economy. The excellent Philosophical Economics blog, in an intriguing post Profit Margins in a “Winner Take All” Economy, comments on this phenomenon. He links to an interesting post by Patrick O’Shaughnessy that presents the following graph showing all US stocks with market capitalization that is larger than $200 million sorted into five bins by their initial profit margins. A clear trend is visible over more than fifty years – from 1963 to 2015 – the top bin of companies remains at the top; the bottom quintile remains at the bottom. This means that the margins of already high-margin businesses are expanding whereas the margins for low-margin businesses seem to be falling even more. Furthermore, O’Shaughnessy shows that this profit margin gap has been increasing over the last two decades in some sectors – technology and finance (see the following graph), but also in the health care and consumer staples sectors. Coming at this anomaly from a different perspective, a recent labor productivity study conducted by OECD found that productivity of the top manufacturers – those at the “global productivity frontier” — grew at double the speed of the average manufacturing firm over the decade after 2000. This gap was even more extreme in services: firms on the productivity frontier grew productivity at a 5% rate, 16 times the 0.3% average rate. And, once again, the gap between the most productive firms and the rest has been increasing over time (see the graph below). So what kind of companies might be occupying the productivity frontier? I think it is highly likely that the gap between those on the frontier and the rest is about their strategic positioning vis-à-vis the digital disruption that is ongoing. In a previous post I have written about the investing implications of this phenomenon, dubbed “software is eating the world” by venture capitalist Marc Andreessen. Companies that are doing the “eating” tend to have increasing profit margins. Moreover, the very nature of digital technology tends to create a “winner-take-all” dynamic, where moats from network effects, patents, regulation, and scale economies allows a concentrated group at the top to earn increasingly higher profit margins. We have already pointed out that the profit margins of the various bins moved roughly in parallel until the late 1990s, after which the profit margins of the top bin proceeded to rise rapidly. This time-frame aligns nicely with the rise of the internet-based economy. Conversely, it is notable that companies in the older sectors of the economy – such as the energy and materials – do not show this rising margins effect. A recent study by the chairman of the president’s Council of Economic Advisers also found that the biggest gains in profits have been among technology and drug manufacturers; their profits don’t come from tangible assets like factories and land, but from intangible assets such as software, standards, patents, and network effects. This also might explain the otherwise puzzling absence of strong capital expenditures even as the economy continues recovering steadily from the great recession – the modern digital economy just does not require that much spending on heavy equipment as the industrial economy of previous recessions. The following diagram is my attempt to depict the on-going battle of companies in the age of digital disruption. The companies in the inner-most ring are former giants that are already dead – killed by the software-advantaged company with the arrow pointing at them. In their heyday we bought physical books at Borders, music records at Tower Records, rented movie DVDs at Blockbuster, and bought photography film from Kodak. These were the large companies of the time that failed to anticipate and adapt to the digital tsunami that has led our reading e-books, stream music and videos, and take digital pictures with our smartphone. The middle ring depicts companies we think are not yet dead but whose profit margins are under severe pressure from their software-armed foes. Again, these are giants of our times such as the venerable New York Times (and all physical newspapers), Time (and all other magazines), the big-four TV networks, medallion-based taxi companies, hotels, travel agencies, and physical retailers like Macy’s and Walmart. I was particularly struck by fact that, even as they were in the process of losing to their digital competition, the companies in the inner ring (Borders, Blockbuster, etc.) actually looked quite attractive on traditional value investing metrics like the Price/Earnings ratio; right up to the very end! There is an elite set of global companies with high and increasing labor productivity as well as high and increasing profit margins. It is vitally important or a company to be strategically aligned with the powerful forces of digital disruption to prevent it from being “eaten”; ideally, it should be the one doing the eating. Value-investing grandmasters like Buffett and Munger have virtually proven the vital importance of investing in companies with long-term-sustainable competitive advantage – moats – since such companies can maintain and compound their earnings over long periods of time. “Digital moats” are precisely those companies that at the intersection of these concepts: they are at the productivity frontier and moated in a way that benefits from the disruption caused by powerful digital trends. Examples are shown as the outer ring of the previous diagram (Amazon, Google, Facebook, Uber, Airbnb, Pandora, Netflix, etc.). Market capitalization indexes as such the S&P 500 must, by their very definition, contain all companies that qualify by their capitalization – whether they moated or not, and companies doing the disrupting as well as those that are being disrupted. I think one can get an edge over the market by concentrating the portfolio around the elite few – the crème-de-la-crème – of companies at the productivity frontier. Of course, a great company does not automatically equate to a great investment – valuation always matters, and a myriad of company-specific issues must to be carefully taken into account before including a stock in the portfolio. Having said that, as more and more people from all over the globe get a smartphone connected to the cloud of digital services, I do think it reasonably likely that digital moats will continue outperforming the market over the next few years. Full Disclosure: As of the time of writing this post, I am long many stocks mentioned in this post, including Amazon, Google, Facebook, Twitter. This post is not meant to be and should not be construed as investment advice of any sort. Investing is extremely difficult, the risk of permanent loss is high, and past results are meaningless in the future. A key question in business (and hence in investing) is: what drives change? Why do dominant businesses get disrupted so frequently by challengers? I posit in this post that most of this disruption is a consequence of a shift in economic scarcity, mainly caused by technological advances. Most businesses can be conceptualized as offering a product or service bundle of value to their customers. The bundle is made up of various modules that combine together to provide the customer a valuable offering. I suggest that advances in technology cause changes in the relative scarcity or abundance in the underlying economics of these modules, and it is these changes in economics that create an opening for a challenger to topple a dominant business. “And so the newspaper bundle, the idea of this slug of news and sports scores and classifieds and stock quotes that arrives once a day was a consequence of the printing plant. Of the metro area printing plant, of the distribution network for newspapers using trucks and newsstands and newspaper vending machines and the famous newspaper delivery boy. That newspaper bundle was based on the distribution technology of a time and place. When the distribution technology changed with the internet, there was going to be the great unwind, and then the great rebundle, in the form of Google and Facebook and Twitter and all these new bundles. I think music is a great example of that. It made sense in the LP and CD era to [bundle] eight or 10 or 12 or 15 songs on a disc and press the disc and ship it out and have it sit in storage until somebody came along and bought it. But, when you have the ability online to download or stream individual tracks, then all of a sudden that bundle just doesn’t make sense. So it [got unbundled] into individual MP3s. 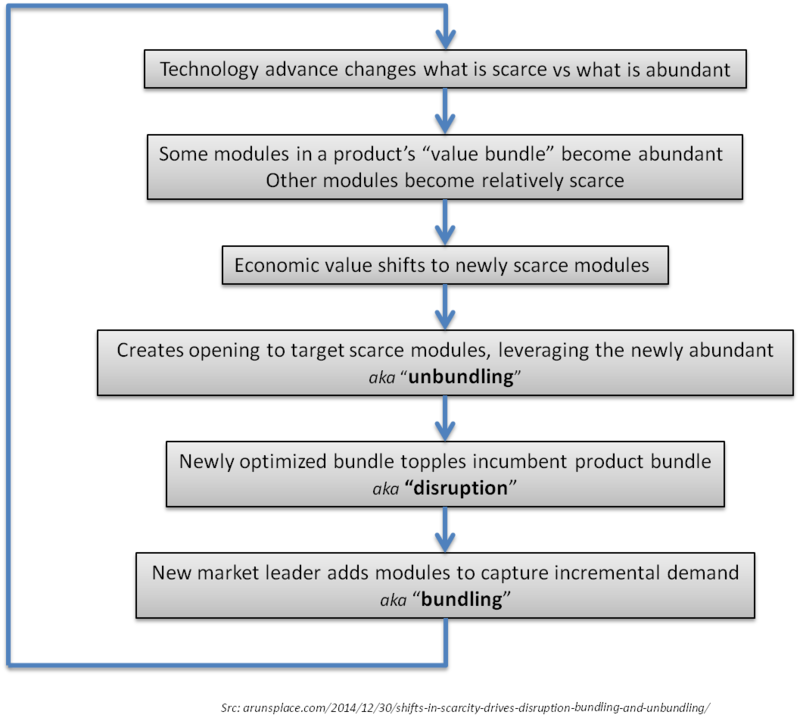 In general, once the deck of economic value has been shuffled by the shift in scarcity, it can create an opening to an entrepreneur to start from scratch by targeting a key module of the old bundle that is now relatively scarce — hence valuable — and leverage the newly created abundance. The Moore’s law driven plunge in the price of communications, for instance, is enabling a lot of startups to rethink existing business bundles by exploiting the “free” distribution available on the internet, just like iTunes did to unbundle CDs and Pandora is doing to iTunes in the example. Once the challenger has won, it is fairly easy for the winner to bundle more and more features around the core module, to increase its value and to capture incremental marketshare. Of course, this process eventually sets up the bloated bundle to become a target for the next new challenger on the block, as technology changes the point of scarcity again! 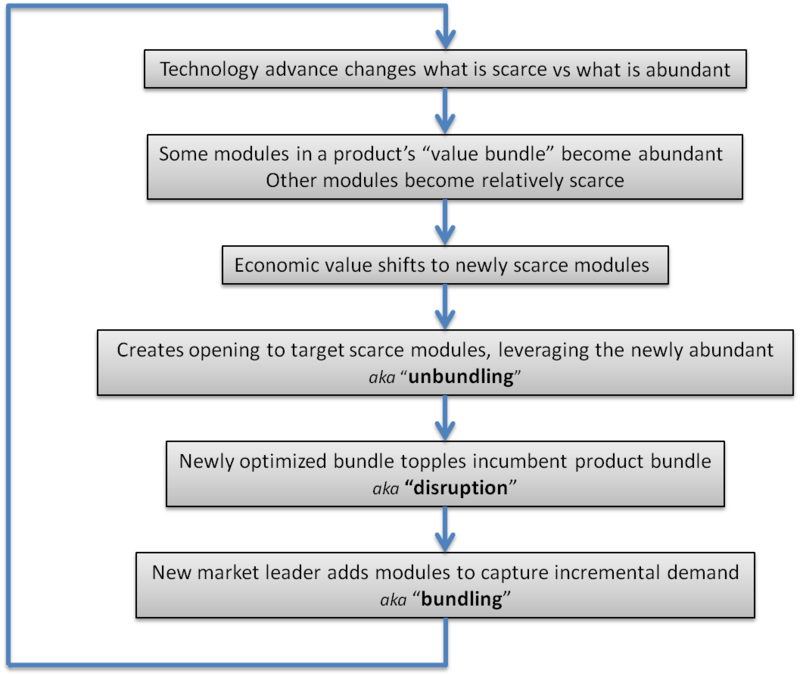 The former CEO of Netscape, Jim Barksdale’s observation: (hbr.org/2014/06/how-to-succeed-in-business-by-bundling-and-unbundling): “there’s only two ways I know of to make money: bundling and unbundling” captures this cycle of unbundling followed by bundling; but he does not really explain why should this be so? Andreessen, in a recent Tweetstorm, has provided a detailed example of this phenomenon of bundling and unbundling (twitter.com/pmarca/status/481554165454209027). Thus the key driver of all the disruption and unbundling is technology driven changes in economic scarcity. 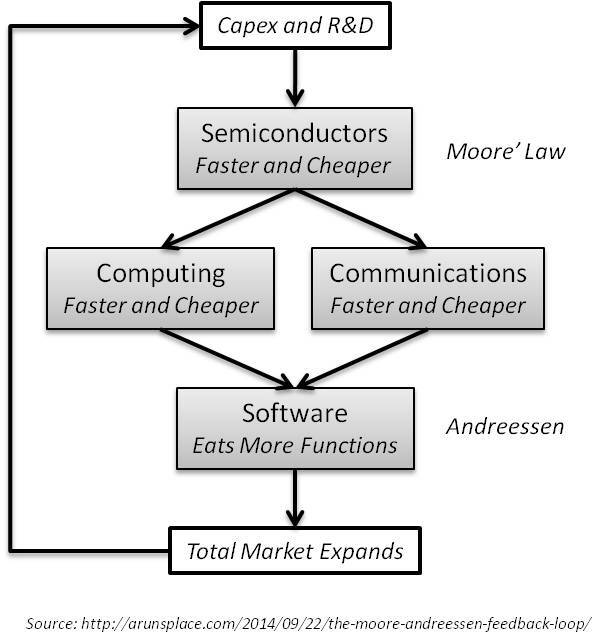 A particularly powerful example of such a technology driver is the virtuous cycle of semiconductors and software advances feeding into each other, diagrammed below (I have previously written about this loop here: arunsplace.com/2014/09/22/the-moore-andreessen-feedback-loop). I think it is vital for a disruptor to succeed that it be better aligned with this loop than the product it is challenging! This is why I think the Christensen model of disruption, while insightful, is not complete. It comes in two flavors: low-end disruption and new-market disruption. Neither is fully satisfying as an adequate model of disruption – a counter-example to Christensen’s framework is the fact that the expensive, richly-featured iPhone manage to completely disrupt the cheaper, less functional feature-phone business (e.g., Nokia) — the exact opposite of what his model predicts! In my framework, by contrast, the key driver (driven by Moore’s law) was the relative abundance, and hence cheapness, of the internet. This allowed the iPhone to feature internet-enabled apps as the main attraction, rather than phone calls (in fact the initial iPhone was not all that great at making calls!). Thus the shift in scarcity/abundance created an opening for Apple to target internet connectivity as the core offering. This, I claim, is a better framework to explaining why they succeeded in disrupting the plain old cellphones despite being much more expensive; it was clearly not an attack from the bottom. (To be sure, smartphones also disrupted PCs, and that fact can be explained as an attack from the bottom as well as an unbundling of PCs due to a shift in scaricity/abundance; I chose the disruption of dumb-phones in this example since that cannot be adequately explained by one of the two frameworks). To be sure, there can be other kinds of technology changes that are not related to semiconductors. But it is really hard to find other examples of something that can grow 40% per year for nearly 50 years! Moore’s law in likely unique in this aspect, which is why I think it has plays such a crucial part in the persistence of the disruption phenomenon, of the kind we have been experiencing in the last few decades. However, I do not share that optimism about the fate of Bitcoin as a global currency; in fact, I argue in this post that Bitcoin represents the Achilles heel of blockchain technology. Of course, the reason why Bitcoins and blockchains are so tightly coupled together is that the blockchain protocol needs incentives for all those decentralized computers busily engaged in the reliable transfer of trust. And the current solution is to get this task done as a side-effect of the distributed systems trying to “mine” Bitcoins. In other words, the mining of Bitcoins incentivizes the distributed computing needed to implement any blockchain’s trusted ledger of transactions. But unlike the obvious value in decentralized blockchain transactions, I think there are fundamental economic problems with the very notion of a currency that is not supported by a central bank of some kind. To see why, consider the following analogy to build up some intuition. Circulating blood is the medium of exchange of energy in our bodies, just like circulating currency (whether digital or physical) is the medium of exchange of goods and services in an economy. As the body grows larger, the amount of total blood needed to fulfill its exchange-of-energy role is proportional to the body size. If there is too little blood, the energy exchange will be deficient; we need to transfuse blood in extreme cases of blood loss. By analogy, as the global GDP level grows, as it does every year, the amount of currency in circulation must also rise, roughly in proportion! The Bitcoin algorithm, however, has no relation to the level or growth of the global GDP. This may well prove to be a significant fatal flaw in its design. A strong implication of thecurrency experiment described in that essay is that any form of currency — including Bitcoin — just cannot become a stable, mainstream currency without a central bank function that acts to stabilizes their value from time to time, and keeps the circulating base of currency proportional to the size of the economy. One could, perhaps, imagine an algorthmic replacement for a human central banker — say a Taylor-type rule — implemented in a decentralized manner, although it would still be a central policy decision, in essence, since it needs to control the aggregate amount of the currency in circulation. However, all that is besides the point since the current algorithm behind Bitcoins is completely decoupled from the size of the economy, since there are going to be exactly 21 millions Bitcoins, a fixed parameter in its very design. This is a major problem that I think will prevent Bitcoins from becoming a global currency of any major standing (as envisioned by its enthusiasts). Perhaps, however, it can survive as a limited sort of transient exchange medium, its value always secured at both ends by currencies that are stably backed by central banking. Indeed, this is exactly how it seems to be working these days. But I am dubious of the long term fate of this as well, since the point about the need to be proportional to the size of the economic “body” still stands, even for transient exchanges; after all, the number of simultaneous exchanges will surely rise in line with the growth of the global economy, thus raising the need for more Bitcoins in circulation. “It’s a method of transmitting money. It’s a very effective way of transmitting money and you can do it anonymously and all that. A check is a way of transmitting money, too. Are checks worth a whole lot of money just because they can transmit money? Are money orders? You can transmit money by money orders. People do it. I hope bitcoin becomes a better way of doing it, but you can replicate it a bunch of different ways and it will be. The idea that it has some huge intrinsic value is just a joke in my view.” — Buffett quoted by CNBC. Buffett’s point about money transmitters not being moated implies that the motivation of miners will be surely affected if the value of what they are mining is subject to competitive erosion over time. Note that Buffett is carefully not saying anything about the value of the blockchain protocol itself. Most articles on Bitcoin end up laying out the future possibilities of blockchains, rather than Bitcoins. I actually agree that the blockchain protocol has great potential; but I find the conceptual foundation behind Bitcoin not quite up to the task. At least for now the two are tightly joined at the hip, and that is a bug, not a feature, in my opinion! It is vital for the integrity of blockchain protocol that Bitcoin miners continue to mine, since blockchain maintenance is a side-effect of Bitcoin mining! Any plunge in the motivation level, and hence the capital investment level, of Bitcoin miners clearly slows things down. If I am right about this (I am not a professional economist), the conceptual deficiency behind Bitcoin could really undermine the long-term prospects of blockchains. The key question: Can the blockchain protocol be decoupled from Bitcoins in some way? Disclosure: I have no Bitcoin related investments at the time this post was written. The principles of value investing, as described by its best practitioners from Benjamin Graham to Warren Buffett, are widely held to be both eternal across time and universal in their application to all kinds of investments. But are they really so? Or, is there something about technology companies that makes them particularly tricky to value? What should we make of the fact that some of the best value investors, most famously Buffett, go out of their way to avoid technology stocks? I look for businesses in which I think I can predict what they’re going to look like in ten or 15 or 20 years. That means businesses that will look more or less as they do today, except that they’ll be larger and doing more business internationally. So I focus on an absence of change. When I look at the Internet, for example, I try and figure out how an industry or a company can be hurt or changed by it, and then I avoid it … Take Wrigley’s chewing gum. I don’t think the Internet is going to change how people are going to chew gum… I don’t think it’s going to change the fact that Coke will be the drink of preference and will gain in per capita consumption around the world; I don’t think it will change whether people shave or how they shave. I have a technology background (degrees in Engineering and Computer Science; worked in technology companies for many years; co-founded a software company). I am convinced, after two decades of experience, that value investing is the right approach to active investing. But beyond my personal concerns, I will argue in this post that the consequences of technology cannot really be avoided by any investor in this day and age. The term “value investing” probably means different things to different people, but its main principles can be summarized quite briefly. The central idea, articulated most clearly forcefully by Benjamin Graham, is that a stock should be thought of as a share of the underlying business rather than a piece of paper, or these days a set of bits in a brokerage account. It has an intrinsic value, which is the present value of all the future cash generated from that business. Since the future is always uncertain, this intrinsic value cannot be determined with any real precision; the price of a stock fluctuates from day to day as various classes of investors and speculators make informed —or uninformed! — guesses about this unknown intrinsic value. Graham advised investors to ignore this daily distraction and concentrate, instead, on the long term fundamentals of the underlying business, arguing that the stock price ultimately approaches the intrinsic value (“in the short run, the market is a voting machine, but in the long run, it is a weighing machine”). A value investor should patiently wait until the occasionally bipolar “Mr Market,” in one of his depressed moods, offers an opportunity to buy a stock below its intrinsic worth. Graham also suggested leaving a margin of safety between its price and its intrinsic value, in case our assumptions turn out to be too optimistic. And when Mr Market, in one of his manic moods, is overvaluing a stock we hold, Graham advises us to sell it. In the memorable words of his most famous student, Warren Buffett, a value investor has to “be fearful when others are greedy and greedy when others are fearful”! Buffett has applied these principles to great fame and fortune, further improving them through the help of his talented partner Charlie Munger. He has described his approach in his highly readable annual letters, and in speeches and interviews over his six decades of investing. Among the many seminal ideas contributed by Buffett and Munger is that the future cash profits of a business, the source of its intrinsic value, depend crucially on its ability to withstand profit-eroding competition: its “moat”. Businesses that have a moat against competitors are worth a lot more than the average business, since they can usually compound their earnings over time, thereby multiplying their intrinsic value. Investing in moated companies have led to outlier returns for Buffett and Munger, as they held on to them for decades, letting the magic of compounding work over time. Finding and holding on to such businesses through the rough and tumble of market mayhem is not easy, however, otherwise everyone would have become a billionaire by following them! I’m no genius. I’m smart in spots – but I stay around those spots. Finally, Buffett and Munger recognize that the market is generally quite efficient, with lots of smart investors competing to outdo each other for high stakes. They suggest, therefore, that investors concentrate their portfolios around a few companies within their circle of competence that they truly understand better than the average investor. Broadly speaking, that completes our brief sketch of the central pillars of value investing. It all sounds very logical and straightforward. What else could there be but this approach? Yet there are many different investing philosophies which have nothing in common with what is described above. Perhaps the most influential is the academic idea, forcefully argued by Nobel-winning economist Eugene Fama, that the market is so efficient that is price of any stock is always right. A direct consequence of this theory is that the central notion of value investing – that the intrinsic value could vary from its extrinsic market price makes no sense. This school of thought, therefore, recommends buying a piece of every company trading in the market without discriminating based on the underlying business value and in strict proportion to their market value (this is called “index investing”). There are many, equally distinguished, economists who vehemently disagree with Fama’s efficient market hypothesis, among them economists Robert Shiller (shared the Nobel with Fama) and Andrei Shleifer. The market is also full of all kinds of momentum and technical analysis strategies that do not pay any attention to the underlying business. There are also investors who specialize in art and antiques, as well as in precious metals like gold and silver; these are valued entirely for their scarcity, since they do not generate any cash flow that can form the basis for intrinsic value. Finally, there are the so-called “noise” traders, pure speculators, devoid of any reliable information whatsoever! Learning from more than twenty years of my own experiments in the markets, I am fully persuaded that value investing is the best approach to active investing (with passive indexing being the wise default for most people who do not have the time or inclination for actively participating in the market). It combines both rational and irrational aspects of human nature in a consistent and practical way. Although simple and elegant in concept, value investing is extremely hard in practice. This mainly due to our own temperament getting in the way — it is highly stressful for social and herd-evolved animals like us to be counter-cyclically fearful when others are greedy and greedy when others are fearful! Temperament aside, my technology background poses an additional problem when it comes to value investing. As already noted, one of the key pillars of value investing is that one should stay within one’s circle of competence in order to have any hope of beating the near-efficient market. Knowing the edge of your circle of competence is one of the most difficult things for a human being to do … You have to strike the right balance between competency on the one hand and gumption on the other. Too much competency and no gumption is no good. And if you don’t know your circle of competence, then too much gumption will get you killed. This rings true to me since the “gumption” needed to buy more of a good stock when it goes down depends upon the degree of conviction one has in the fundamental soundness of the underlying company. And such contrarian conviction comes from deep knowledge that can only be had within one’s circle of competence, almost by definition of the latter. But this poses a practical dilemma: given my background, the center of my circle of competence seems to be precisely those types of technology companies that are so judiciously avoided by nearly all the great value investors of the past! In theory, there is no difference between theory and practice. In practice, there is! Perhaps the key to resolving this dilemma lies in understanding exactly what is it about technology that makes it such an anathema to the great value investors? As Buffett suggests, in the quote cited at the beginning, the rapid pace of technological change means that today’s dominant company will likely become tomorrow’s lunch for the next new start-up in silicon valley. Experienced value investors prefer a durable moat against competition; fast changing technology, however, makes maintaining such a moat for any length of time difficult, if not impossible. To get a sense of why this might be the case, let us turn next to the technology in the very eye of the raging storm of change — the ubiquitous smartphone. Consider just a few of the hardware gadgets that have been replaced by software on our smartphone. Besides being a phone, of course, as well as a texting and emailing device, the smartphone contains software apps that replace what used to be physical calendars, contact books, and scratch pads; apps that replace the compass, map, and the GPS-based navigator; apps that replace the camera, video-camera and calculator; apps that convert the phone into a credit card reade. Various apps now monitor our health and keep track of our activities. Software on the phone has made it our social networking machine, our personal shopper, and our travel manager; searching and browsing software has replaced physical dictionaries, encyclopedias, yellow pages, and newspapers. Software like Google Now is even beginning to intelligently anticipate our needs — it informs us of important upcoming events without our asking it (“leave for the airport now!”), acting like our personal assistant. It seems like the list of hardware and human functions that have been at least partially replaced by software expands daily. And its not just the smartphone. Software is encroaching into heavy industrial equipment too. General Electric now puts chips in their turbines that track of all rotations cumulatively so that their software can predict upcoming failures and schedule maintenance safely in time. Cars already have dozens of sensors and microprocessors monitoring both the internal and external environment, from engine temperature, oil quality, to the distance from other cars; software apps in cars now control the reversing camera, gas gauge, service alerts, GPS maps, radio, music players, and other devices. Taxis are being scheduled, and their approach monitored, by smartphone apps. There are sensors in the generators at the electrical utility plant, along the transmission lines, and at the meter at home, making the whole grid smarter about distributing electricity. Intel chips are already monitoring the “flow” at “smart urinals” at Heathrow airport, to help schedule maintenance during low-use periods. Software can even “print” a prosthetic bone replacement that is customized to fit our individual elbow or knee — software is entering our very bones! Venture capitalist Marc Andreessen’s trenchant phrase — “Software is Eating the World” — evokes the reach and power of this pervasive and powerful phenomenon. Software by itself, of course, could not have done all this transformation and disruption. 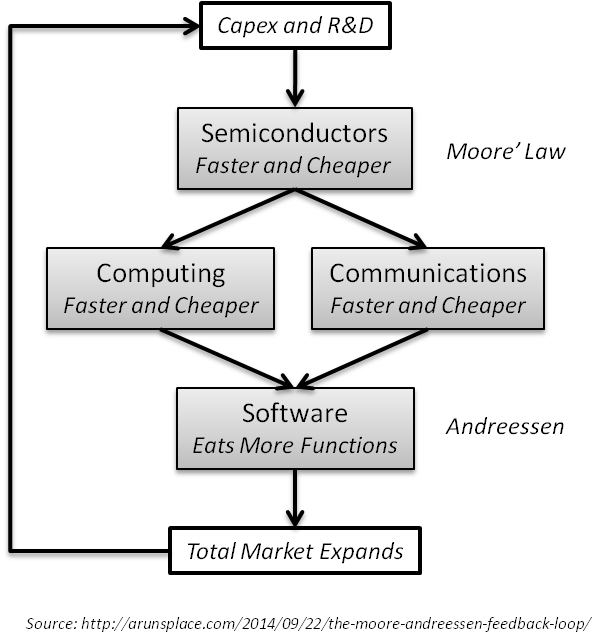 In a previous post, I have described the “Moore-Andreesen” positive feedback loop between semiconductors and software that drives this disruptively-creative force. As semiconductors get cheaper and faster every year, both computing and communications become more capable, enabling software to “eat” more and more functions performed by people or hardware today. This extended reach expands the total market for semiconductors, enabling yet more investment in advances that make semiconductors even faster and cheaper — completing the self-reinforcing loop. The bookstore chain Borders got “eaten” by software-based Amazon. The music store chain Tower Records got “eaten” by iTunes software. Apple’s iTunes itself is getting “eaten” by Pandora and Spotify streaming software. The video chain Blockbusters got “eaten” by Netflix software. Newspapers and magazines got “eaten” by the websites and blogs and online ads. Yellow Pages got “eaten” by Google software. Kodak got “eaten” by digital photos and smartphone cameras. AT&T and Vodaphone are under attack from Skype, Whatsapp, Facetime, and Facebook. Retailing giants like Sears, Target, Walmart, and Tesco are being “eaten” by Amazon. Bank clerks got “eaten” by ATM machines. Human brokers were “eaten” by online brokerage sites. Travel agencies are being “eaten” by Expedia and Travelocity, etc. Recruiters are being “eaten” by LinkedIn and other social networks. Insurance underwriters and actuaries are being “eaten” by “big data” analytic software. … the list grows every day. This should be of critical interest to all value investors since companies in the process of being eaten alive can often seem attractive to investors — inexpensive on the basis of the usual valuation ratios — right until their very end. New kinds of “value traps” lie in wait for investors unaware of the disruptive power of software. Even more surprisingly, some companies that seem to be perpetually unprofitable on the usual earnings basis can sometimes turn out to be quite robustly moated! Consider TCI, the formidable cable monopoly assembled by John Malone, a veritable grandmaster of the information economy. As reported by WSJ’s Mark Robichaux in Cable Cowboy: John Malone and the Rise of the Modern Cable Business, TCI, remarkably, never reported positive earnings on a GAAP basis over its entire three decades of existence and yet was eventually bought by AT&T for 48 billion dollars! Incidentally, even some of Buffett’s most cherished moats have not escaped this sort of software disruption. One of his favorite investments, Washington Post, eventually lost its advertising moat to Google, and was recently sold to Jeff Bezos, the CEO of Amazon, and another master of the information economy. And long time Buffett holdings like Walmart and Tesco are under attack from Amazon these days and seem to be slowly losing their vaunted moats. In other words: Buffett clearly ignores software, but will software ignore Buffett!? I think the answer lies in the exponential nature of the semiconductor-software feedback loop. Disruptive change started within the limited circle of technology companies at first, but the relentless arithmetic of exponential growth (for instance, semiconductors are billions of times more powerful and cheaper now than just a few decades ago) means that this circle grows concentrically every year, and is beginning to intersect virtually every aspect of our world. To get a sense of this, just consider the fact that there are now more than a billion smartphones in the world, up from zero just seven years ago. Furthermore, phone companies are projecting that the remaining four billion people carrying ordinary feature phones today will also convert to smartphones soon, as prices continue to plunge exponentially due to the power of the hardware-software loop described above (some Indian smartphones cost less than 35 dollars today). And, as the earlier examples of hardware-eating apps suggest, a smartphone acts like a Trojan horse for proliferating software, spreading it all over the world. Instead of avoiding technology, I decided to invert, and fully embrace the dreaded intersection of value investing and technology as an area of competitive advantage — a personal niche — in the world of investing. This, however, is much easier said than done, since to the rapid pace of technological change really does make durable moats really hard to establish and maintain and moats are critical to compounding value. Its not supposed to be easy… Everything that is important in investing is counter-intuitive, and everything that’s obvious is wrong! I have to confess at this point, though, that the counter-intuitive aspect of investing is exactly what attracts me to it in the first place! I think it somewhat analogous to the “aha” pleasure of scientific discovery. One has to be deeply and thoroughly informed of the existing state of all the relevant knowledge. While necessary, however, such knowledge is not sufficient, in either science or investing. The crucial next step is to have a non-obvious hypothesis about what is currently unknown (in science) or mispriced (in investing) and be proven right over time! Just like no scientist is likely to get any credit for rediscovering something already known, no investor is likely to rewarded for investing in companies that are already well appreciated by the market. The equivalent of that deadly phrase “already published” in science is “already priced into the stock” in the world of investing. Information goods usually have high fixed costs of initial production but virtually zero costs of reproduction. Since the marginal cost of an information good is nearly zero, their price also tends to head towards zero, the presence of competition. Information goods often have to be experienced in order to be valued. Producers of information often have to give away some version of it for free and investing heavily in building a reputation for quality. Near-zero variable costs imply that an information-based products can be reproduced in billions of units with very little additional investment: hence a successful product can scale to massive volumes with surprising speed and efficiency. Zero incremental costs causes the unusual pricing patterns often found in information-based products: the same product is sold at different prices in multiple versions with superficial variations. Even free versions sometimes make economic sense! Information-based goods have to interconnect with many complementary products in order to work: such interconnections eventually lead to the network effects such as high cost of switching. Information-based networks often obey the non-intuitive economics of increasing returns. They are fast changing due to the presence of positive feedback loops: virtuous and vicious cycles with tipping point adoption dynamics. Information-based goods usually have decreasing supply costs as their fixed costs are amortized over larger volumes; in addition they benefit from increasing demand for every incremental user, due to the network effects. The information age will likely be governed by a series of monopolies, each successive disruptor toppling the older incumbent. New kinds of moats exist in the information-based economy. Value investors like to invest in companies with a tangible book value, which often comes from owning “real” things such as fields full of oil or gold. Buffett, to his credit, was one of the first to discover the merits of owning intangible assets like the rights to produce an addictive product like Coca Cola or the rights to a popular brand like Gillette or American Express. Since the essence of information, by its very nature, is intangible, all value investors will soon have to deal with this new type of company, whose intangible assets can appreciate due to network effects rather than depreciate like physical plant and machinery. Google has a huge new moat. In fact, I’ve probably never seen such a wide moat. Finally, many companies that seem to be outside of the technology sector may have information processing at the core of their value creation. For example, Express Scripts is a company in the healthcare sector that processes one out of every three prescriptions in the country; every time a patient presents a prescription to the pharmacist, an internet transaction is triggered to request the insurance company to approve the payment for fulfilling the script. This flow of information between the doctor-patient-pharmacy-Express Scripts-insurer is the key to analyzing its value (What are the network effects? Is the feedback loop virtuous or vicious? ), as a part of the information economy we have been discussing. Similarly, many traditional value investors often mistakenly analyze Amazon as a retailer. However, as described in his annual letters to investors, Bezos is deliberately and methodically trying to transform the economics of retail — with its high variable costs — into a software company with high-fixed but low variable costs! In order to fully understand the implications of this, and to evaluate the strength of Amazon’s moat, it must be viewed primarily as an information processor, rather than as a retailer (although it is that as well). It seems clear, at least to me, that the old value investing strategy of avoiding technology stocks is no longer tenable as software keeps eating more and more of the world. This does not mean, however, that we can afford to throw away the hard-won insights of value investing. It is worth remembering that the Nasdaq crash of 2000 was led by those “dotcom” information economy stocks! It is all too easy to get carried away by “new era” stories spun by today’s version of castles-in-the-air companies like Pets.com, Homegrocer.com, MySpace, and the like. There is a lot to be learned from the great value investors over the past century. A stock will always be nothing but a piece of a business; its value will derive entirely from that business’s ability to withstand competitive erosion of its profits, i.e. its moat. Valuation always matters, and it helps to have a margin of safety when purchasing a stock. Long term returns are dominated by the ability of the underlying company to compound its earnings over the years. These principles are indeed eternal as well as universal; they apply with equal force in the information economy. However, the economics of information goods is unusual and non-intuitive enough to merit a re-conceptualization, ab initio, of competitive advantage, moats, and the basics of valuation. In the end I feel that this creative frisson is exactly what makes it an exciting time to live at the center of the ever-growing intersection of value investing and the information economy. Living on the fault line may be tricky, but the future looks promising – the world is coming our way! Disclosure: As of the time of writing this post, I am long many of the information economy stocks mentioned in this post, including Amazon, Google, Facebook, Twitter, Express Scripts, Intel, and Microsoft. This post is not meant to be and should not be construed as investment advice of any sort. Investing is extremely difficult, the risk of permanent loss is high, and past results are meaningless in the future. This post combines two famous but separate observations, made 46 years apart, about technology advances into a single integrated feedback loop that I think has been the major source of disruptive creation in the world over the last fifty years; it still continues, unabated, today. Moore’s Law: This is not really a law in the sense of scientific laws of nature; rather, it is a prescient observation made by in 1965 Intel’s co-founder Gordon Moore on the exponential pace of change in the semiconductor industry. He noticed that the transistor count in semiconductors seems to double every couple of years. Surprisingly, his observation continues to be valid more than 49 years after he first made it. This relentless advance has been like a giant clock that drives the entire technology industry forward every year. Venture capitalist Marc Andreessen’s observation (first made, I think, on the pages of WSJ in 2011) that “software is eating the world” trenchantly captures the fact that software replaces more and more functions that were formerly performed by humans or physical machines with every passing year. This is also a relentless advance that feels like a force of nature in its power to disrupt. Moore’s Law is the result of human ingenuity and hard work fueled by ever rising capital expenditure and R&D on semiconductor fabrication processes. Each advance has required major breakthroughs at the level of material science, industrial processes, and applied quantum physics. Amazingly, such advances have indeed been made just in time to preserve the cadence of the “law” for over four decades. The following graphic captures the fact that the number of transistors found on a chip has been doubling every two years — i.e., growing at more than 40% per year! But the “ante” in terms of capex and R&D dollars needed for such complex advanced rises every year. Intel, Samsung, Taiwan Semiconductor, et al are nowadays spending ten-plus billion dollars every year to keep the semiconductor manufacturing process advances coming. So where are the returns needed to fund these investments coming from? This is where the crucial role played by software comes in. As it becomes more and more capable, it can do more and more (a tautology!) thus expanding the market for semiconductors. And the expanding semiconductor market, in turn, justifies an increase in the investments needed for the capex and R&D required for driving Moore’s law forward. There are two parallel channels that allow software to become more and more capable as a result of better semiconductors: better and cheaper computing and better and cheaper communications. Think of the speed and cost of today’s internet and speed and cost of today’s smartphones as compared to the slow modem lines and slow and clunky computers of even a decade ago. Both these advances are synergistic and are critical enablers of the advances in programming techniques and tools needed for software to eat more of the world. As software captures more functions it expands the market for computers and communications. Nearly 2 billion people already have the powerful supercomputers in their pockets known as smartphones, and serious projections are suggesting the possibility of 4 to 5 billion people having smartphones communicating with each other and running powerful apps in the next few years. Software, by itself, cannot advance at 40% per year type rates without improved hardware to run on and improved networking speeds. The major advances in software tools — from assembly coding to higher level languages to object-oriented languages, from waterfall to Agile programming techniques — are all fundamentally enabled by faster computing speeds provided by the underlying hardware. Computers by themselves will completely starve of data-to-compute if the speed and reach of communication pipes linking them together did not advance along with them. Imagine connecting your super-powerful, instant-on, tablet to any of the slow dial-up modems of the old days! The massive capex in semiconductors needed for improving both computers and communications cannot be justified without the expanded market provided by software eating more of the world. And so on; all components of this positive feedback loop have to advance together, mutually re-enforcing each other, to keep it going. The scale of this phenomenon is not that easy to grasp. In personal conversations, people nod knowingly, thinking that all I am saying is that technology progresses every year, and of course it does. However, that is not my point at all. There is probably no other phenomenon, natural or artificial, that has shown this kind of exponentially fast growth such an extended period of time. I can safely claim this because of the unusual power of compounding: if anything has been compounding at this high a rate for so many decades, we would see it nearly everywhere already today! To appreciate the stupefying scale of the phenomenon, let me contrast it to another technological revolution. During the Industrial Revolution, that supernova of all changes in the human condition, growth in Western Europe accelerated by a puny 1% per year! Even this tiny amount though, when steadily compounded for a hundred years (most historians date the Industrial Revolution roughly between 1750 to 1850), resulted in a massive improvement in living standards from the complete lack of growth for the thousands of years before it (see the zero net growth in income per person for thousands of years on the left of the Industrial Revolution, during the so-called “Mathusian Trap” period, in the graphic below; source: figure 1.1 from a recent book on this subject by economic historian Gregory Clark). 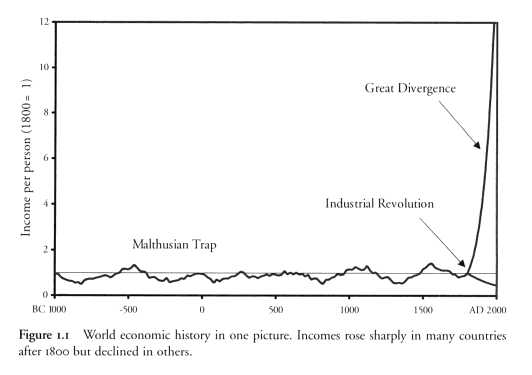 So if the Industrial Revolution changed the world so dramatically with a mere 1% growth compounded for a hundred years, consider the relative impact on the world affected by Moore’s Law, which has compounded at over 40% per year for nearly 50! Anything growing at this blistering pace should become millions of times better (faster/cheaper) in only a few decades, and indeed our computers do show exactly such improvement – that smartphone in our pocket really is more than a million times more powerful than the most powerful computer on the planet from fifty years ago. It is hard to think of many other examples that show such an astounding growth pattern; and the examples that do come to mind seem to be, in one way or another, intersected and transformed by the power of the Moore-Andreessen loop. Try thinking of a counter-example! This sort of massive change can cause a fundamental shift in what is scarce and what is abundant every few years. In my opinion, it is this frequent shift in the point of scarcity that has been the real driver of the constant disruption that characterizes our information age. As if an avatar of the ancient god Shiva of Hindu mythology, who is said to destroy in order to create anew, this loop is a powerful force of disruptive-creation: companies that are better aligned with this loop can — and often do — replace incumbent companies that are slower in adapting to its consequences. A phenomenon that is strikingly similar to “software eating the world” seems to be happening right within the motherboard of all the smartphones and tablets and laptops. 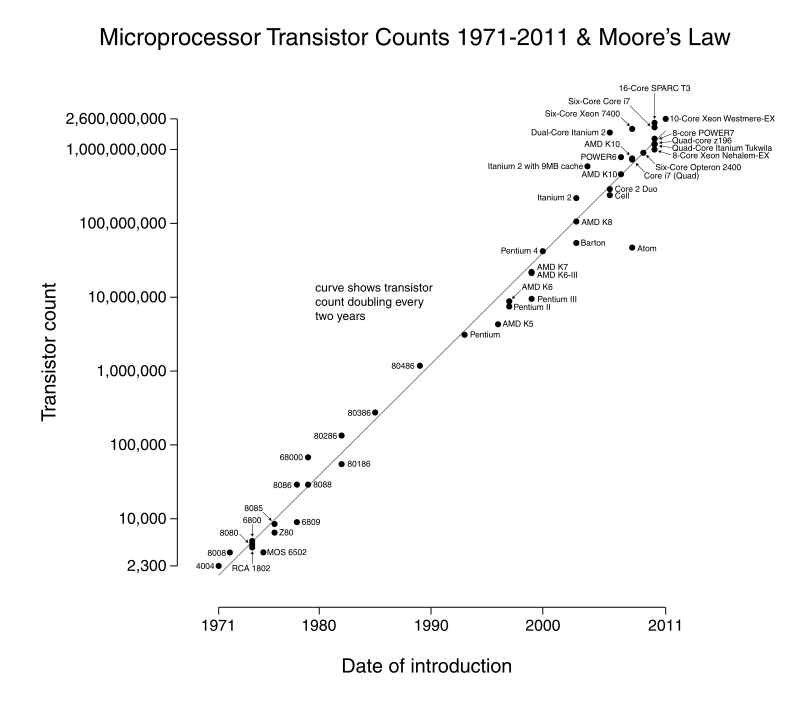 A “System on a Chip” (abbreviated SOC or SoC), as the name implies, contains a whole system of modules on one silicon chip by absorbing more and more functions that were formerly performed by independent chips. Functions such as graphics, modems, DSP, and various kinds of memory have already been absorbed. I think the abandonment of the baseband chip market by Texas Instrument and Broadcom is the latest example of this corollary phenomenon. The baseband function now forms just a piece of a larger SoC chip produced by companies like Qualcomm, Mediatek, and Intel. The economics of producing them as part of an integrated SoC became increasingly tilted in their favor compared to the baseband function chips made by TI and Broadcom until the latter finally got eaten up. I see this as a trend powered by essentially the same kind of loop as diagrammed above, with Moore’s law shrinking the size of semiconductors and interconnection technologies with every new generation when combined with the ever-growing power of chip design software. The expanded market (e.g., billions of smartphones and perhaps tens of billions of “internet of things” devices) enabled by the resulting SoCs fuels the necessary investments in capex and R&D, completing the loop. Disclosure: I am long Qualcomm and Intel in various portfolios at the time this post was written.